“Whether they’re running, jumping, climbing or dancing, there’s nothing better than seeing girls and young women comfortable in their own skin. And that’s what Monkeybar Buddies is all about,” say the folks at Monkeybar Buddies, which designers and fans like to call MBB for short. Our Monkeybar Buddies collection at Adorables Children includes colorful shorts designed to be soft against the skin, but not bunch up under a skirt. They’re versatile fashions, wearable with dresses or T-shirts. In fact, she can wear MBB shorts as bathing suit bottoms at the beach and jump right in. 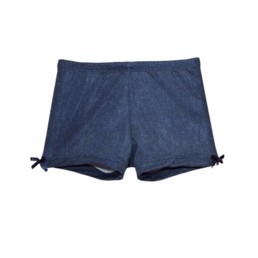 MBB shorts are made of a special, heavy-weighted blend of spandex and nylon. Gina says thinner spandex/nylon blends won’t last, and cotton won’t move with you like her MBB shorts now on sale at Adorables Children. Mix and match them with our famous-maker children’s dresses and separates. Our collections include the latest designs from the top children’s fashion houses. Shop by brand, style and size. We have terrific new “Clearance” buys every months. Sign up for our email bulletins to be the first to learn of the latest children’s apparel trends. When it comes to Monkeybar Buddies, some of MBB’s famous fans include Hollywood actor Ben Affleck, whose daughters wear them under skirts and dresses. Actress Jessica Alba’s daughter has been photographed wearing them with colorful tees. Mom blogs across America are raving about how their daughters can now do cartwheels while wearing dresses without revealing anything more than their love of playtime. Little girls love that their MBB under-dress shorts arrive in cute zippered pouches. See our entire assortment of Monkeybar Buddies here! She can play on the monkey bars with or without a dress on when she’s wearing cute denim shorts by Monkey Bar Buddies. The denim look adds blue jean appeal to girls’ shorts made of a heavy-weighted blend of spandex and nylon to keep their shape without bunching under tops and dresses. The bows at each leg add a pretty touch. She can look like a fashion diva and still and play all day long wearing Monkeybar Buddies’ Pink Shimmer shorts with a shiny finish. These darling shorts are perfectly precious undergear under party dresses. Lite Brite shorts by Monkeybar Buddies offer a rainbow of colors in a retro geometric design that will really pop under tees, tanks and skirts. 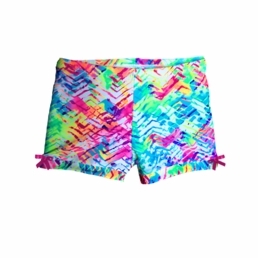 These super soft shorts will light up smiles on little girls who love lots of color.